I give you... an antique cradle phone! 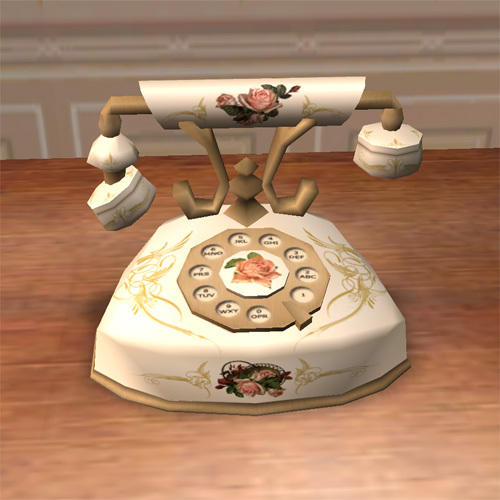 This lovely table phone has been a long time coming, mainly the amount of time it took me to become skilled enough to create it. However, with Numenor's amazing cloning templates, some perserverence, and several tries, I have come up with something I like... that actually works... and can be recoloured! The animation is not absolutely perfect - it clips a little bit into the ear when in-use, and the hand may clip into the handset during some animations. There is no cord, and sims will still start a call by dialing, and perhaps even leave the handset somewhere stupid - it will still behave like a normal phone, just with a different mesh and textures. Not much I could do about that but it's still quite lovely and looks very nice for Victorian sims. 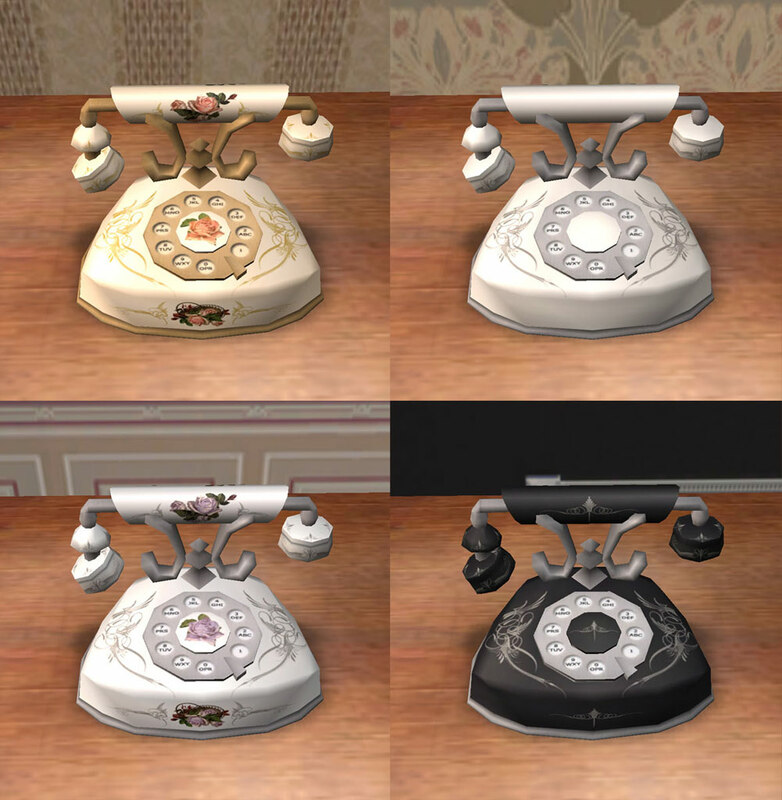 It shows in the catalogue in the same place as normal phones (Buy Mode - Electronics - Small Electronics), and is 200 simoleons (a bit more expensive than normal). 710 polys, 630 vertices (pretty darn low), created from scratch in Milkshape. This should be EP and base-game compatible... I have Pets and all the Pets functions seem to come up on it as well. I would appreciate testers - I don't tend to play much myself. I am also not an incredibly experienced object creator, and probably had no business creating a phone, so use at your own risk. I've taken care to make the map extremely easy to recolour, and have double-size layer-separated PSDs that you can PM me for if you want to recolour it easily using some of my graphics. Three recolours are included, plus the default cream with brass, gold curliecues, and roses. NUMENOR!!!! Thank you thank you thank you! The phone cloning templates which I used to clone my phone from, and his very clear instructions had me with a phone package in under 10 minutes, and a few values from the Simstones phone for the handset and I was almost done! Everyone who has contributed to the creation and development of SimPE. Couldn't do this without your efforts. House of Lime for the curliecue font and Antique Clip Art for the flower graphics. Star, for encouraging me even when I get all mopey and convinced I have an atmospheric pressure considerably lower than my surrounding environment. Thanks, hon.